It’s that time of year for a hearty mid-winter meal that feels good making and eating. This is an elegant and delicious recipe. I served with brown rice and a quick spinach salad. Smear ½ teaspoon of garlic on underside of each chicken breast. Place three spears of asparagus on top of garlic, roll breast and secure with a toothpick. Heat oil in a large frying pan at medium-high heat. Brown all sides of the chicken roll. Reduce heat to medium high. Add wine and stock to the pan with the chicken. Simmer, turning once, until all liquid is reduced. Remove from heat to rest while preparing sauce. Remove toothpicks. Beat egg yolks with a whisk in a small stovetop pan. Add mustard, lemon juice, and hot sauce to yolks, and whisk to combine. In a separate pan, melt butter until boiling. Very slowly pour melted butter into egg yolk mixture, whisking constantly. Place egg yolk pan on medium-high heat. Very slowly pour milk into egg yolk mixture, whisking constantly, until smooth. Remove from heat and add more milk as needed to adjust consistency of sauce. 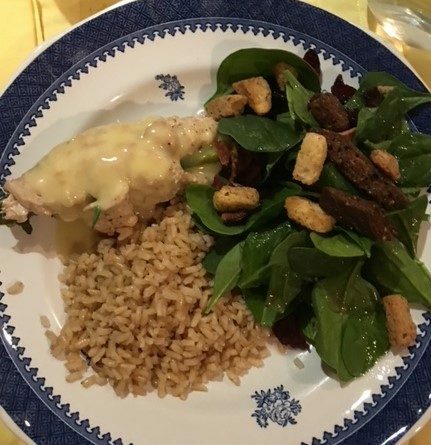 To serve: Plate chicken topped with sauce and sides of rice and salad. Serves 4.